The Russian Embassy received a registered mail, which had two World War II era medals and a letter from the Magué family. “Mr. Ambassador, we were very touched and saddened to learn from the Internet about the death of Alexander Prokhorenko, however there was no news on [French] media… He died like a hero and we’re very proud of him,” read the letter of the Magué family obtained by Sputnik. The medals sent were Ordre National de la Legion d’Honneur (“The Legion of Honor”), the highest French order for military and civil merits first established in 1802 by Napoleon Bonaparte himself, and the World War II era Croix de Guerre (“The Cross of War”) with a bronze ribbon.The Magué family sent the medals that were awarded to two of their own family members who fought Nazi soldiers during World War II. “We give you the medals of our family… we think it would be a good thing to return them to his [Prokhorenko’s] family,” the letter said. 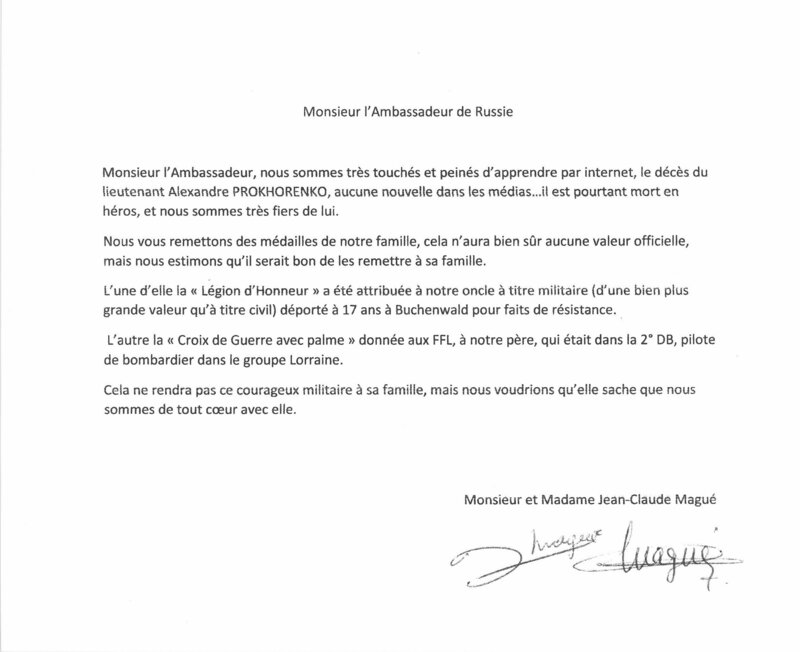 The Magué family’s gift and letter to Prokhorenko’s family aren’t the only gifts and gestures of support that the Russian embassy has received from French citizens. Some people sent money, asking to buy something for Prokhorenko’s unborn child. “Now all of this stuff is in the embassy. We’re currently thinking how to transfer all of this to his [Prokhorenko’s] family in Russia,” a Russian embassy representative told RIA Novosti. Prokhorenko, the 25-year-old Russian lieutenant, was killed during the military operation to liberate the ancient city of Palmyra from Daesh terrorists. He was working on the ground, providing intelligence and coordinating Russian planes to attack Daesh targets in the city. During the operation, Prokhorenko’s position was discovered and he was surrounded by terrorists. To avoid being captured, possibly tortured and interrogated, the young man called an airstrike on his own position.